While all the Hello Kitty fanatics think this is the greatest thing ever, those that live in Hello Kitty Hell know this is just the first step in a master plan. They probably have sealed a deal where every tourist is given a Hello Kitty “shoulder massager” to release the stress on the long trip over here. I wouldn’t be surprised if it’s that long before you see the evil feline running for Japanese prime minister. wow that was quick! i just saw this news item today and thought of you. hello kitty reprazent! Happily I can say I did not send you that link to the crazed story…. I hope you survive today. it’s going to be a rough one — I can’t believe that Hello Kitty is now a Goodwill Ambassador. But that’s how all crazed dictators start, right? Being nice? I really want to Mock you now. But to be honest, the fact that Hello Kitty is thought important enough to be a “Goodwill Ambassador” scares the hell out of me. I for one don’t want Hello Kitty to rule the world. If Hello Kitty does End up Ruling the World, EVERYONE will be in Hello Kitty Hell. I’d propose Escape on A Spaceship, But they’d probably Hello Kittyfy that too. Well, can Hello Kitty be assassinated now? I mean, I’m not advocating it, but since she’s ‘real’, does that mean the possibility that it will happen? Hello Kitty is finally taking over the world….RUN FOR COVER!!! To be an ambassador, don’t you need a MOUTH for that? WOOOOHOOOOOOOOO!!! GO HELLO KITTY!!! YOU DESERVE THE HELL OUT OF IT!!!! GO GO GO!!! The readers are starting to wake up and see that all you spread is falsehood about Hello Kitty and they are getting their revenge. Hello Kitty is the chosen ambassador because she is loved by everyone and there is nothing that you can do about it. Your lies just make us stronger to get the truth out. I’m amazed that this blog still even exists considering how one sided it is. But no matter how mean you may be, Hello Kitty will triumph because good always does over evil. And I went straight here…to comfort the blogger and bloggers at this time of woe. But how the hell is the rest of the world supposed to take Japan seriously now? LOL. Sigh, what is next? Mickey Mouse being declared the U.S Ambassador? Japan has obviously replaced Tojo with a more insidious mastermind of despotic cruelty. Hello Kitty is revealing herself as the Anti-Christ! REPENT! Ahhhh….YES!!! I knew this would show up on here soon!! And it has!! I’m so happy it’s happened….not just cause I love the feline so much, but because I know it saddens you oh so much!! LOL!! I really feel that it is time for the Hello Kitty time machine to be invented. Just imagine what the world would be like if we can take Hello kitty back in time and just at the right moment switch it with JFK only to see HK get it’s brains blown out. wouldn’t that make a better world for all of us………????? OR if we really wanted to be creative we can invent the Hello Kitty space ship and fill it with every bit of HK merchandise that has ever been churned out and slam it into the first black hole that we can find…. And again, STOP with the ‘us’ crap… what, you got a mouse in your pocket? Don’t lump everybody in with your insane a$$! Please! Have you actually read the URL?? Last time i looked it is http://www.kittyhell.com, i.e. it was created to bag the living snot out of Hello Kitty. I am sure you are a little upset by some of the comments here but why do you come here if you are a HK fan? The creator is using this as an outlet and to allow others with similar nightmares to vent and to rabbit on about just how invasive this rubbish is on society and the people around them. Yes i agree that some people see HK as a cute little character and they are perfect items for the school playground when you are 13 but for the rest of us we find that @$%%$$!!! cat as about as cute as a stomach pump and the more it is shoved in our faces, the more we want to put it all in a pile and burn the crap. We all have a right to say what the hell we want about HK and it is not some contest to see who has the loudest voice or who’s opinion really matters. It is a God Dam Stuffed toy man…. get over it! If you really want a warm and fuzzy blog then create one but for this one just let us all say what we want and have a little fun reading the well written content of this blog. Darlene is back, and still spewing the same verbal diarrhea she always does. Whoop-dee freakin’ do. Will she EVER get it through that empty head of hers that this blog is, in fact, NOT filled with her fellow HK-worshipping freaks? And I, too, applaud Silent Bob and his words of wisdom. But unfortunately for Bob and the rest of us, his words fall on deaf and delusional ears (aka Darlene). But kudos for even trying! And as for this whole HK “ambassador” crap, it is further proof that Sanrio wants to take over the world, and should be viewed as a global threat. The cat must die!!!!! I agree with you Bear_1… THAT “[email protected][email protected]#$!” Cat must die!!! I chose silent bob as my name because of the similarities between the theme of that movie and the theme of lunacy that envelops the HK addicts.. think about it !!!!!! thanks for the support but the chances of getting through to a person who’s cheese has slid off it’s cracker is minimal i know, but i had to try! High explosives are NOT beyond my means. For those wondering, I am referring to the death of the Stuffed version not any person. My other half came up with a good idea. She suggested that we cover it with some yummy substance and feed it to a bunch of very hungry rats. The unfortunate side effect of this is that it will probably kill the rats and lets face it, the dirty little buggers are far more appealing than Hello Kitty. 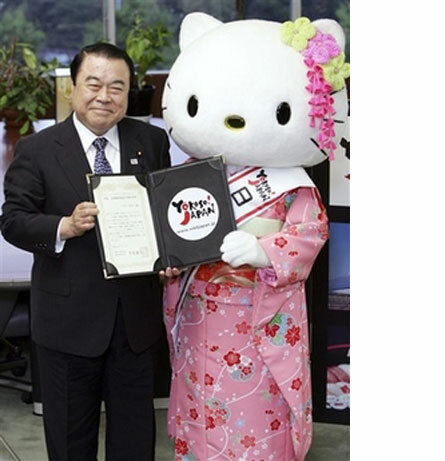 since the little kitty is a “Goodwill Ambassador”, geuss that means she can be assassinated by the hello kitty ar 15…. ??? we’re talking over the world. AWESOME! OMG it’s alive!!! But how does it eat with no mouth!! As an HK lover and an American who loves Japanese culture, I was thrilled to see this in the news!! As Americans, we have a hard time taking this seriously because we have these stereotypes that dictate what level of “cuteness” men and boys are allowed to enjoy. The thing that all of you who have never been to Japan need to understand is that “cuteness”, in general, is completely tolerated and encouraged for people of any age or gender in Japan! It is, therefore, not entirely surprising that they would crown a stuffed cat as a goodwill ambassador. Especially since HK has been a part of their culture for over 50 years. Good job kitty! I just love how exuberant the actress is in the costume. (I hope it is an actress.) Just watch how she tries to (unsuccessfully I might add) embrace the man in the suit. You have to admit this is necessary to take a step back from the suffocation and propriety of modern governmental institutions and laugh at how unusual this circumstance is. And you have to see their angle is two fold; not only is Hello Kitty endearing to post war generations by drawing in a closer relationship between these countries, but the Sanrio company is a juggernaut of globalization and commercial codependency in the east. This speaks volumes about post Cold War dynamics… money speaks… nationalist identity vanishes. What we’re witnessing is a travesty in history my friends… The demise of a great culture taken down by the ‘innocent’ facade of an expressionless caricature. Whoa to those who call good, evil and evil, good. dude tht is sooooooooooo badass!